Pelscope is a powerful tool to analyze/measure/compare picture/video quality. Pelscope supports still images, videos and raw camera images in different formats. 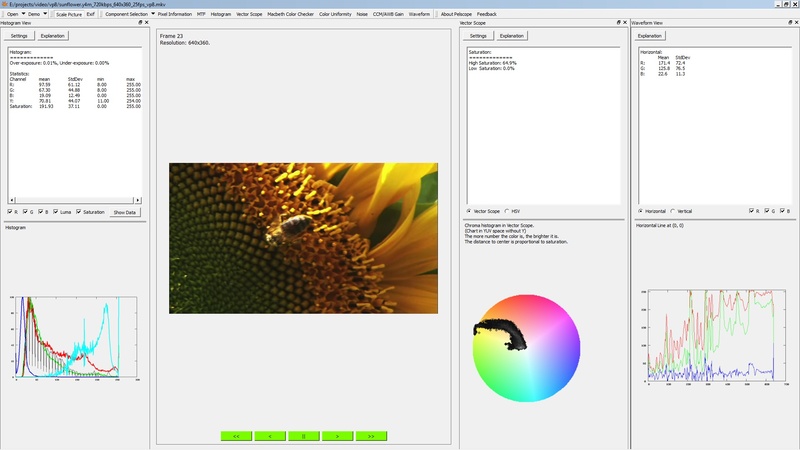 And Pelscope supports different color visualization methods, including visualization in RGB/HSV/CIE Lab space. It also provides measurements on MTF, Color Accuracy, Noise. Support most image format, including jpeg, png, bmp. Support most video format, including mp4/3gp, m2ts/m2ps, mkv/webm, avi. Support YUV 420/422/444 up to 14bit per pixel. Support raw data up to 32bit. Pixel values on RGB/XYZ/CIE Lab/CIE Luv/HSV/YUV spaces. Sharpness analysis on human faces, image center or 9-points. Color Accuracy using Machbeth Color Chart. MTF using iso12233 Test Chart. Need new features? - Tell us right now!